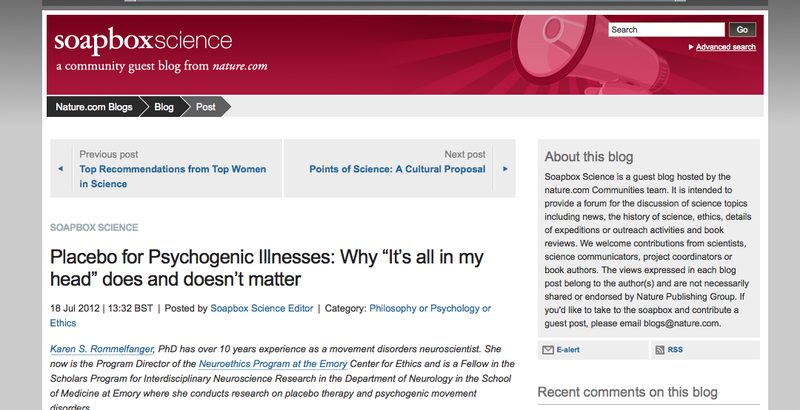 Recently, I composed a piece for Nature Science Soapbox entitled, Placebo for Psychogenic Illnesses: Why “It’s all in my head” does and doesn’t matter and in the Huffington Post on Placebo. Both pieces work to reframe and deepen our understanding of medicine and illness by utilizing neuroscience. Importantly, this process must include humility for the limitations of neuroscience and our current understanding of the brain while also maintaining an openness to what we don’t know, avoiding foreclosing opportunities for richer understanding of the brain’s capabilities. I believe neuroethics discourse needs to occur with all relevant stakeholders, and as I discussed with colleagues recently, I feel it would be a failure if I couldn’t engage in neuroethics discourse outside of my discipline (I admit that I’m well-rooted in neuroscience). I’ve had colleagues voice concerns about misinterpretations of what we say by the public and sensationalizing of our findings in the popular media. Generally, these, primarily academics, use these as (not entirely unfounded) excuses to avoid speaking with the public or general audiences. This is a mistake. Neuroethics is a discipline that directly speaks to the implications of neuroscience for society and its ethical norms; we must involve society and general audiences. This necessarily means including not only individuals outside of our discipline, but individuals in our broader communities. Recently, I received an emotionally charged response to my Nature Science Soapbox piece, where, unfortunately, the reader felt I had dismissed her and her son’s medical reality. I understand that this misinterpretation will happen often as I’m trying to work with deeply engrained social norms about mental illness, stigma, and evolving descriptions of what the brain does (and even the mind does). You can read her comment here and my response can be found below. Thanks for your comment, Kathleen. To be clear, this article is not about dismissing PANDAS or Dr. Trifiletti. This article is about 2 things: 1) re-framing the way we conceptualize psychogenic illnesses and placebo by 2) utilizing evidence-based arguments—in this case utilizing neuroscience. The overall goal being to advocate for ways to minimize suffering and to explore innovative ways to help people, in this case psychogenic patients, who are truly suffering and lack standard measures for medical care. How do we use the phrase, “It’s all in your head,” and I invite you to start with asking yourself. Generally, it’s used to describe psychological phenomena, thinking, feelings, or “mind”. If it’s “all in your head”, it’s almost something to be dismissed. If you have a problem that’s “all in your head,” it’s not truly “real”: you should “get over it”. And if you don’t or can’t, it reflects poorly on the very fabric of your character: you’re weak-willed, maybe even failing morally. Because of advances in neuroscience, we now understand that many of these psychological phenomena are intimately tied to changes in brain chemistry, and electrical activity in the brain. In this case, “it’s all in your head,” as it’s used above, stops making sense; it’s a false distinction between what is a “real” disease and what isn’t. For example, PANDAS and psychogenic disorders are equally real, as real as cancer. These all physically affect the body– and I consider the brain as part of the body. Historically, as a society, we have relied on technology to define disease. And as technologies become more sophisticated, we are learning more and more about how the brain works. For example, conditions that cause enormous suffering, such as epilepsy, and dystonia were formerly considered “not real”, believe it or not. As technology has grown more sophisticated, we can now attribute epilepsy to abnormal clusters of electrical activity and dystonia to aberrant circuitry in the brain. Similarly, placebo, which was thought to be nonspecific, “fake” even, now has been demonstrated to have significant physiological effects in the brain that correlate with reported benefit (from both patients and doctors). What I want to share with non-neuroscientists, is the sense of wonder and humility scientists have with regard to biological phenomenon and living. We, as a discipline, must challenge our assumptions, and revise our thinking, all of the time. Scientists do this through evidence and empirical work. And although we currently don’t have technology to measure something, doesn’t’ mean we won’t in the future. The girls in LeRoy are an unfortunate case study in just how unnecessarily worse the situation can get when society uses false distinctions of “what’s in your head” and what’s not. The implication being that “what’s in your head” is NOT real and therefore stigmatized. These girls, whose suffering and conditions are very real, were only made worse on all accounts, by this type of logic. In sum, this article is about respectfully re-framing the way we, as a society, define disease and medicine by utilizing scientific evidence, in this case based in the brain sciences. And by re-framing the way we see psychological phenomena through the lens of science, we may eliminate the unfair stigma and suffering associated with false distinctions between what’s in the mind versus what’s in the body.